This Semi-Live bowhunt is provided by our good friend and outstanding videographer, Drew Butterwick of Legacy Sportsmen. Drew is hunting with Chris and Frank Hood from Predator Camo. It is written by Drew who provides the guide's perspective on this particular bowhunt. Enjoy! - Bowsite.com. I was born and raised in Colorado, but spent 10 years away from home living on Alaska’s Kenai Peninsula and spending winters filming outdoor TV and guiding in Texas and Mexico. This past May, I made the move back to Colorado and began dreaming of fall elk hunts the second I crossed the state line. We recently acquired the exclusive rights to hunt private land with access to national forest. The game is nearly impossible to access via public roads and trails. Between the dark timber ridges, several wide valleys create open, lush meadows perfect for rutting elk. Before the leaves even show the first signs of changing colors, the mountain air fills with resonating bugles and the obvious sound of cracking antlers. Oh to be back home. 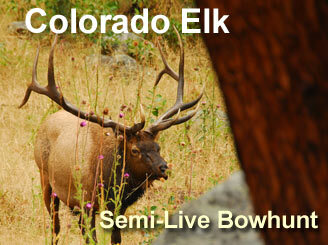 I’d invited Frank and Chris Hood from Predator camouflage to come out and try their hand at elk and mule deer. I’d teased Frank and Chris with pictures and video of bucks and bulls on the hoof, but their schedules were making it hard to commit to a trip. Finally, at the last minute, they were able to shuffle things around. They arrived Monday afternoon with a truck full of camera gear, bows, arrows and virtual toy store of camo. 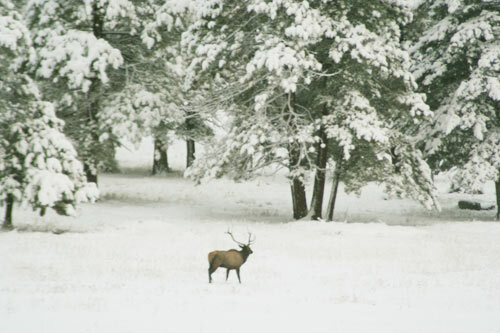 Not only had Frank and his son Chris come to hunt what is arguably the best calling week of elk season, but they also arrived to big fluffy flakes and six inches of new snow on the ground. After unpacking, we decided to take a drive and look around, possibly catching a glimpse of something in the open. It had dropped over 50 degrees in a day and with winds reaching 25 knots and all the new snow, so the animals were pretty well tucked away. Typically in Colorado, it reaches 60s and 70s during the day and maybe gets into low 40s at night. So we took the opportunity to snap a few still pictures and take video for the new Predator camo print and television ad campaigns. It was fun to get out in the Winter White during bow season. 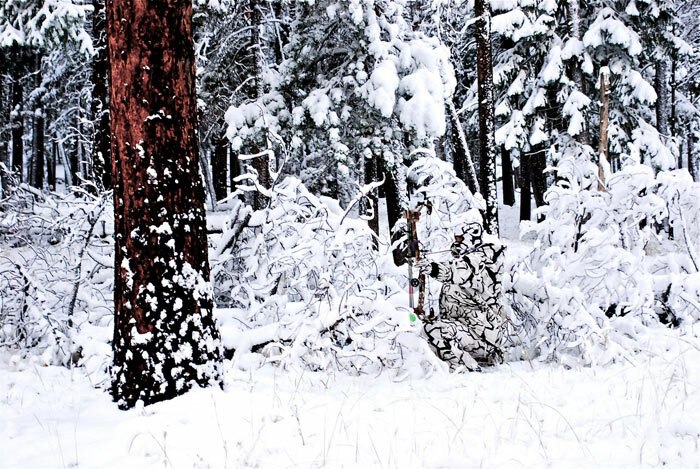 Wind would be an issue as usual, but we wouldn’t have to worry about getting spotted in this camo. There was about an hour of light left when the second big meadow came into view. Frank pointed and almost asked and exclaimed at the same time, “There’s something! Is that an elk? That’s an elk.” Sure enough, there was a lone bull just walking out of the trees into the open. He wasn’t especially wide, but he had unreal brow tines and was certainly a shooter six point bull. I snapped a couple of quick pictures and proceeded to drive past the meadow for about a quarter mile. We quickly and quietly parked the Land Rover and bailed out into the woods. We scampered through the snow and positioned ourselves downwind of the last place we’d seen the bull. Frank was the hunter, ready with bow in hand. Chris sat just behind with the big XD Cam and I fell back about 50 yards to call. I threw out a real timid bugle and followed it up with several different pitch cow and calf mews, using two different reed and diaphram calls. Then we waited. It was so bloody quiet. You couldn’t hear anything. Usually elk make an embarrassing amount of noise. But it was still. I called a few times over about 15 minutes and kept the sequences short and only used cow and calf calls. Chris turned towards me and signaled with his hand, letting me know the bull had moved on. I couldn’t see over the little rise where the six-by-six had come into the calls. He hung up about 65 yards in front of me, but still about 45-50 yards in front of Frank. The wind was a bit swirly on the hilltop and apparently the cautious bull had caught our scent. Chris caught a few seconds of video as the bull snaked through the pine boughs. No arrow flew, but a pretty good start to the hunt, considering we only went out for an hour orientation and scouting drive. The clouds began to lift somewhat, causing the temperature to drop into the 20s. It was going to be cold in the morning, but we also knew that should really make the bulls active. Hard to get a good night’s sleep on Christmas eve … or the equivalent.